These neat little car models are meant to be raced. The parts are made out of tough ABS plastic instead of the usual brittle polystyrene and no glue is required for assembly, all parts are snapped together or held by screws. The windows are tinted dark brown to hide the total lack of interior details. Front, side and tail lights are molded in the body, but decals are provided for all of these. An electric motor has to be purchased separately but the models do come with all the gearing and switches and even a sachet of grease. The tough lightweight bodies make these cars suitable for conversion to slot cars. 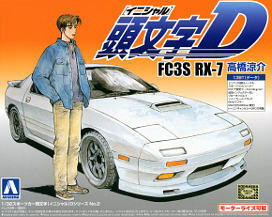 This kit accurately depicts a 1991 'Infini IV' model RX-7, down to the rubbing strips along the body, circular tail lights and late style rear spoilers. The faired-over door mirrors were optional. White body, black chassis parts, a set of grey Watanabe wheels, rubber-like slick tires, a well-printed set of decals and some bags with gears, bearings and screws make up this kit. In 2013 this kit was rereleased with new box art and a new catalog number, the contents of the box are identical to the first release. 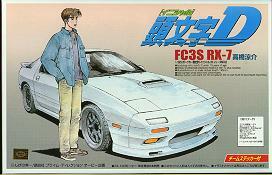 This kit depicts a pre '99 model RS/RZ. Yellow body, black chassis parts, a set of grey Mazdaspeed MS-01 wheels, rubber-like slick tires, a well-printed set of decals and some bags with gears, bearings and screws make up this kit. The Double-U kits are Chinese-made unauthorized copies of the Aoshima models listed above. 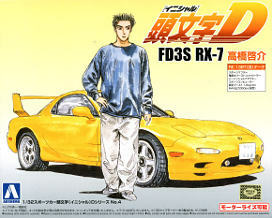 The box-art for the Double-U kits is almost identical to that of the first Aoshima release, but contains some funny errors. Bodies are made of high-impact polystyrene instead of ABS. With the Double-U kits an FA-130 type electric motor is included. 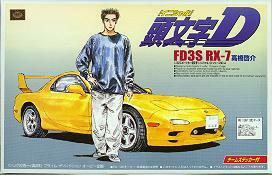 There are Watanabe 8-spoke wheels included with the FD3S kit instead of the 5-spoke MS-01's. Printing quality of the self-adhesive stickers is not as good as the originals. Note that the tires are made of softened polystyrene and will leave burn marks on other polystyrene parts (body, tinted windows, rear wing and door mirrors) when touching these parts for any length of time. The wheels are made of polypropylene which is not sensitive to the softening agents used in the tires.